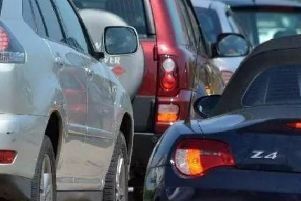 Roadworks on the A47 are causing long delays for motorists around Peterborough today, Tuesday July 5, and the queues are likely to continue until next year. Work began yesterday on plans to reduce congestion at the junction 20 roundabout of the Paston Parkway - the A47/A15 Dogsthorpe interchange - which highways bosses say suffers from congestion, particularly during peak times. The number of lanes approaching and on the roundabout will be increased from two to three in both directions and full traffic light signalisation put in place. But there are already long queues from the A15/A47 junction back towards Thoney. The works are also causing heavy traffic through Eye and on the A1139. The works, due to continue until Spring 2017, will also include the installation of LED street lighting and carriageway resurfacing with a reduced noise surface material. The city council has been awarded £5 million funding from the Greater Cambridge Greater Peterborough Local Enterprise Partnership to make the capacity improvements at this important junction that provides interchange links to the A1, A47, A605, A15 and A16. Councillor Peter Hiller, the city council’s cabinet member for growth, planning, housing and economic development, said: “Peterborough is going to experience significant growth over the next ten years, with numerous developments planned - including Paston Reserve, which will consist of approximately 1,500 homes. “This scheme will result in improved journey times for road users, will directly assist in reducing congestion and also provide additional capacity for the extra growth identified. Lane closures will be in place for the duration of the works and occasional weekend and night time closures will be required in order for some construction activities to be completed. Night works will be advertised on site, two weeks prior to the works being carried out, and noise will be kept to a minimum.